Title: Looking North on Yankee Road. 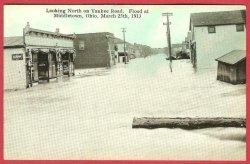 Flood at Middletown, Ohio, March 25th, 1913. Condition - Very good to excellent.